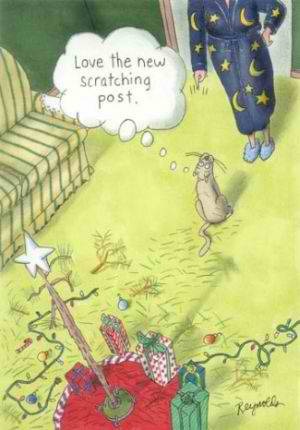 Editor’s Note: Every year my cat writes a Holiday Letter From Da Kitteh. This started several years ago after I received a very proper Holiday Letter from some relatives. LOLSpeak, also known as LOLCat when used by cats. The singing is optional. That first year, I sent the LOL Speak version to my 86-year-old grandmother on a whim. Not owning a computer or being tech savvy, she had never seen LOL Speak. But that didn’t matter; she LOVED it. My 86-year-old grandmother “got” LOL Speak. She said she laughed so hard tears streamed down her face. She brought it down to dinner at the retirement home and read it to her dinner companions, who also loved it. She loved the letter more than anyone else has ever expressed to me. Nothing makes me happier than to know my writing makes someone laugh, and especially that it did that for my grandmother. Last year, my grandmother, and Checkers, my co-pilot and the original writer of the Holiday Letter From Da Kitteh, both passed away. I couldn’t bring myself to do a letter. This year, Pye will write her first Holiday Letter From The Kitteh. I hope you enjoy it as much as my grandmother would have. Oh hai! Mah naym iz Pye, short fur Pyewacket. 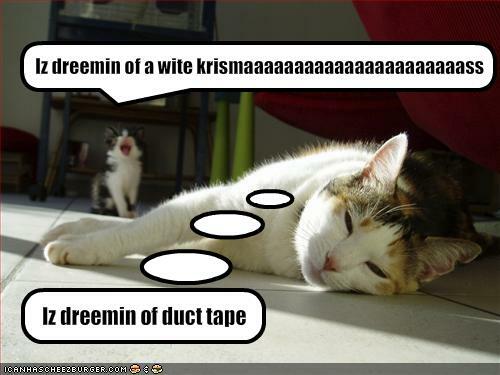 I wuz namd aftr famous kitteh in da moviez. Im teh kitteh hoo showd up on mah hoomanz doorstep last yer an decidd to let her be mah mom. Last yer, I wuz to lil to rite Holidai Lettr Frum Teh Kitteh, so u didnt hear frum me. But im hooj kitteh nao so u git ur furst holidai lettr frum me! I knoe ure vry happeh bout dis. Iz been strange yer ov livin inside an outside an inside an outside. Mah hooman sez I needz to lern to use teh littr box *evry* tiem. I doan knoe y so i doan do it. I got lawts ov toys to pulay wif inside. Sum ov mah favorite things r to sleep an to beg mah mom for treats. She sez Iz spoild rotten. I doan knoe wut dat meanz, but I hope it meanz I git moar treats. Mah hooman has lawts ov jobs so she can brin home teh kibblez. In addishun to her Park Host job, she iz still writin for Yahoo, an jus startd as part-tiem reportr for wan ov teh local newspapers. She iz also still werkin at teh hardware store, but planz to quit any minit. She likez travelin an writin teh best, an especially writin on dis blog. She cant wait to git bak on teh road again. She will be spendin sum tiem at teh coast dis holidai, meetin up wif several single rvers. She finks dis wil b fun. She took short trip to California to see frenz an familiz ovar Thanksgivin. I didnt liek it cuz someone else came to fed meh. I run frum evryone whoz not mah hooman. Unlez dey ware da cowboy bootz. Kitteh lurvz da cowboy bootz. I doan knoe mutch bout dis Christmas ting, but I knoe it meanz moar treats an toys so I gues it be gud ting. Mah hooman an I hope u has Merry Christmas Catmas an Happeh New Yer! And whatever you do, have a good time. Merry Christmas, Kernut, and safe travels! U too, Kitteh! We love the holiday letter from Pye (also known as Da Kitteh). We’re still freezing here in the southern Utah desert, but at least the pipes haven’t frozen again! Pye writes a pretty good Christmas letter! Love to both of you. Merry Christmas to you and your “owner”. Wink-wink. Tank u, Andy! I preshiate da invit, but Iz dun like teh coldz or when teh RV howse moovs. We wil visit u sumday when itz warmz an suny! Meowy Catmas!